If you want to know how beautiful Taiwan really is, you have to come and see for yourself. You will be amazed at the diversity of ancient species this beautiful and relatively young island has to offer. Come and explore its numerous mountains, forests, wetlands and oceans, and find an incredible collection of natural ecosystems. Taiwan lies off the southeast coast of the Asian Continent, where the tropical and subtropical zones come together. Surrounded by the sea and dominated by high mountains created by tectonic action over the eons, the country features a full range of climates and terrains from the tropical to the frigid. The variations in weather, geology, and elevation give Taiwan an unparalleled richness of flora and fauna, including many endemic species that are found nowhere else in the world. Taiwan is, in fact, a northern-hemisphere microcosm and natural treasure house that, truly, must be seen to be believed. Taiwan is surrounded by oceans and therefore has a long coastline, which offers different sceneries wherever you go. The West Coast mainly consists of sand dunes, sand beaches, sand bars and lagoons, and its straight coastline is rather monotonous. The East Coast on the contrary presents a dramatic coastline of towering cliffs that almost directly descend into the deep sea. The coastal plains here are very narrow. The rock formations at the North Coast alternate with beautiful bays and offer the most varied coastal landscape of Taiwan, while the South Coast mainly consists of coral reefs. The offshore islands of Taiwan also offer a great variety of geographical landscapes that are characteristic for the region, such as the basaltic rocks of the Penghu islands, the granite rocks of Kinmen, and the marine erosions of Matzu. Taiwan harbors a great diversity of organic life, and some variations are rarely found elsewhere in the world. An example is the black forest similar to that in Germany, with vegetation going back 30 to 60 million years, such as Taxus sumatrana, mangrove, Taiwan isoetes, and the rare high-altitude grass plains. The world's oldest amphibian, the Formosan salamander, can also be found here, as well as the Formosan black bear, the Mikado pheasant and the land-locked salmon. The beautiful azalea, cherry blossom and maple leaf are also subjects of admiration. If you want to experience this diverse animal and plant life, consider a visit to one of Taiwan's national scenic areas, national parks or forests, or nature reserves, as these form the most ideal outdoor natural resource learning opportunities in Taiwan. Taiwan's national parks, including Yangming Mountain (Yangmingshan), Taroko, Yu Mountain (Yushan), Shei-Pa, Kending (Kenting), Kinmen, Dongsha Atoll, and Taijiang, form the back garden of Taiwan and in themselves are natural treasure-houses. Next to beautiful sceneries, they provide the shelter to unique animal and plant life, including insects, fish, and birds. The natural reserves actually form miniature ecosystems that not only provide a protected environment but also offer a great alternative for recreational activities, environmental education and academic research. Here, visitors can get away from their hectic lives in the city and enjoy the serene environment. 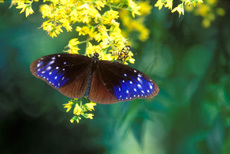 You can also come to Taiwan to watch its numerous species of butterflies and birds. Some 17,000 different species of butterflies are known around the world; almost 400 can be seen in Taiwan, 50 of which are endemic to the island. There are many different sites where you can go to watch them dance in the air, including Doll Valley in Wulai near Taipei, Yangming Mountain (Yangmingshan) National Park, Mt. Jiaoban, and Mt.Lala along the Northern Cross-Island Highway, Qilan near Taipingshan (Ta-ping Mountain) , Guguan, Li Mountain (Lishan) , and Cuifeng along the Central Cross-Island Highway, Nanshan River and Huisun Forest near Puli, Shanlin River (Sunlinksea) in Nantou County, Butterfly Valley in Maolin near Kaohsiung County, Sheding Park and Nanren Mountain (Nanrenshan) in Kending (Kenting) , and Butterfly Valley in Taitung.